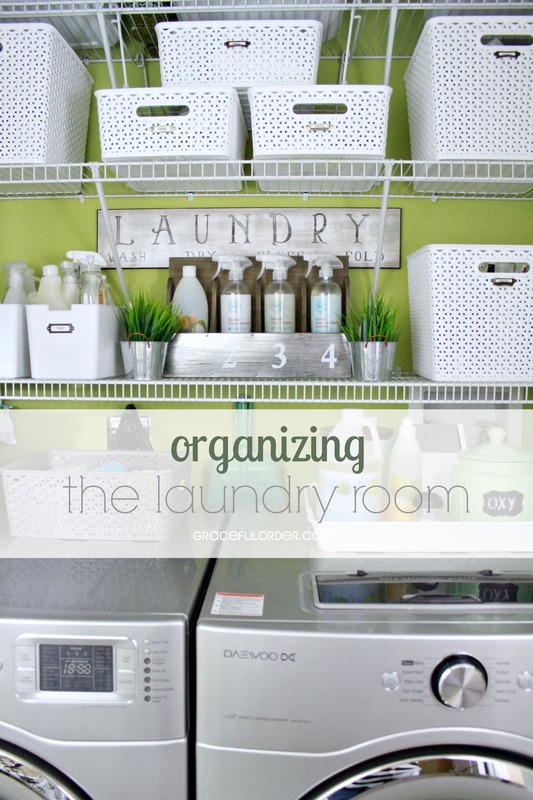 A few days ago we organized the laundry room and I wanted to share some of my favorite tips for organizing laundry closets for those of you (like me) that have a smaller area to work with. Use vertical space for storage by adding shelves. When we purchased our home, the laundry closet had one shelf above the washer and dryer. We added an additional two shelves to maximize the storage right up to the ceiling. This made a huge difference and using wire racks was an economical way to make the space more useful. Use the side walls for extra storage. I added a few small shelves and two-tiered baskets to hold more products and for little decorative touches. I added these metal adhesive labels just for decoration. Add a clothesline to dry small items. I added this retractable clothesline to dry tank tops and some other pieces that tend to shrink in the dryer. In the corner, you can also see that I hang my cleaning gloves from a hook and a clip. They dry faster and they are out of the way. 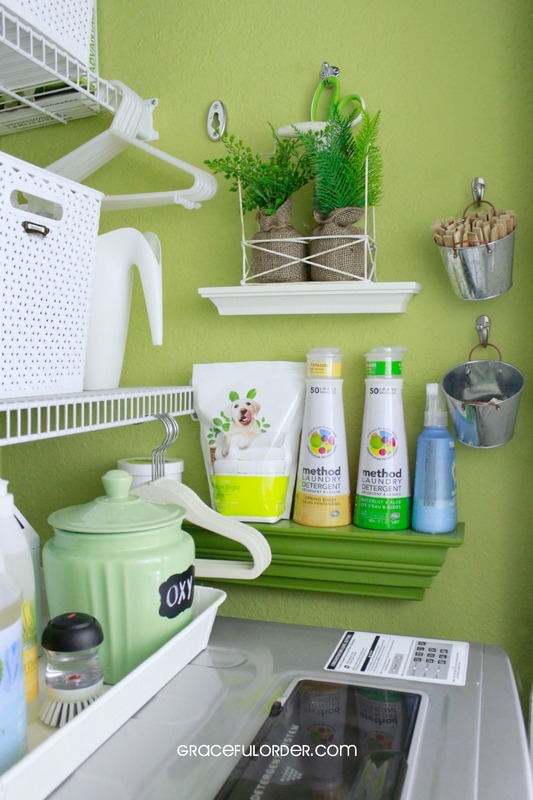 The clothesline that I added doesn’t hold larger pieces of clothing and I have literally used every corner of this little green closet. 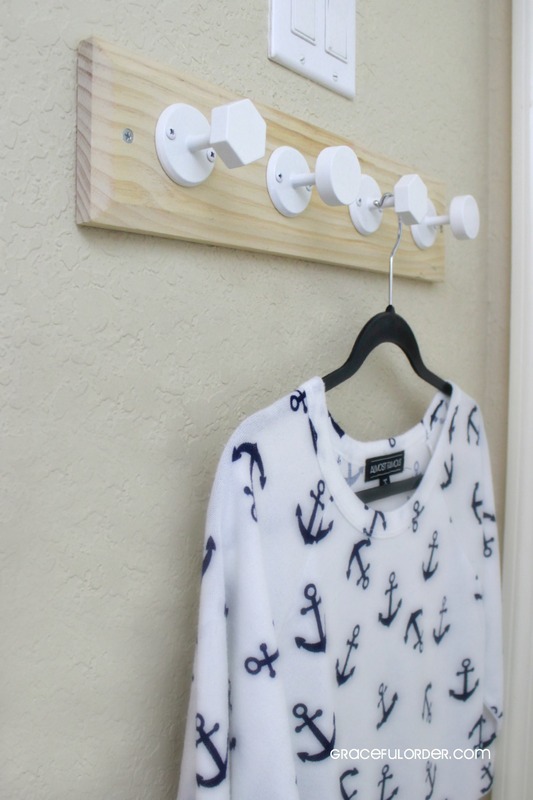 I added a shelf with hooks on the adjacent wall to hold shirts that are meant to hang-dry. The hooks are from the Young House Love line. They have the cutest hooks and shelves. Add a mini trash can. I found this small trash can at Target and it is perfect to throw away dryer lint or little wrappers that I find in the boys pants before washing. Add storage for loose change. These little buckets from the Target dollar section, hang from a hook and they hold change, buttons and clothespins. Keep extra hangers in closet. 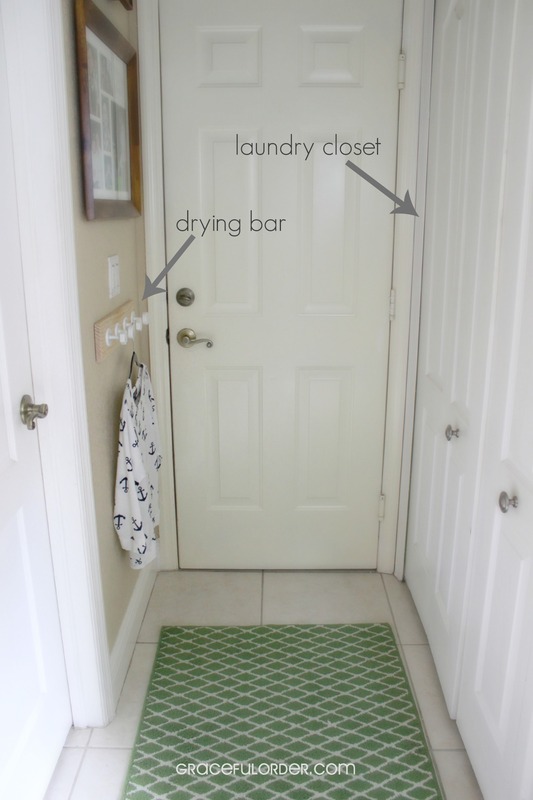 Rid your master closet from all the extra hangers and bring them into your laundry room. I keep kid and adult hangers in the laundry closet to make putting away laundry easier and also for drying damp items in the drying hook as soon as I take them out of the dryer. A small space like a closet, is a great space to try a wall color that you love but don’t want to commit to putting in a main living area. If you change your mind about the color, it is quick and inexpensive to change in the future. 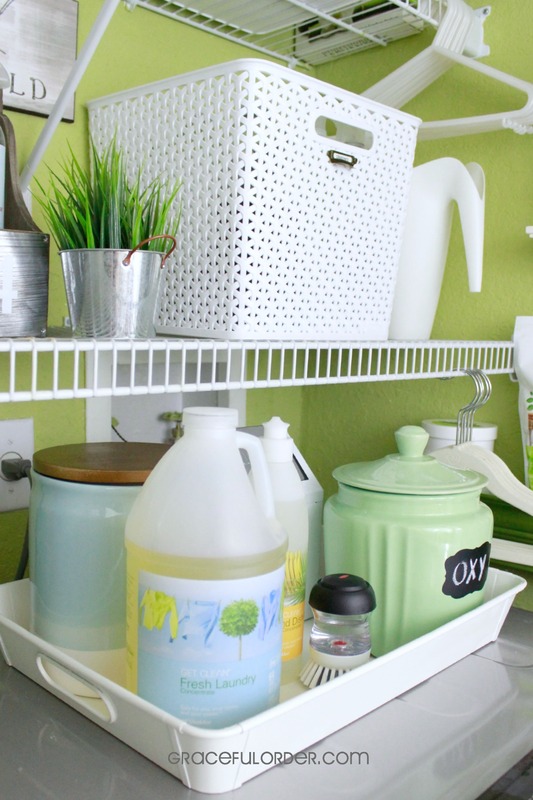 Add matching baskets that are functional to give your space a cohesive and bright feel. Although my baskets are not all the same, they are all white and they brighten up a space that is otherwise in a pretty dark corner. Any tips on where to find the laundry big tin? I have seen them at Homegoods and TJMaxx. 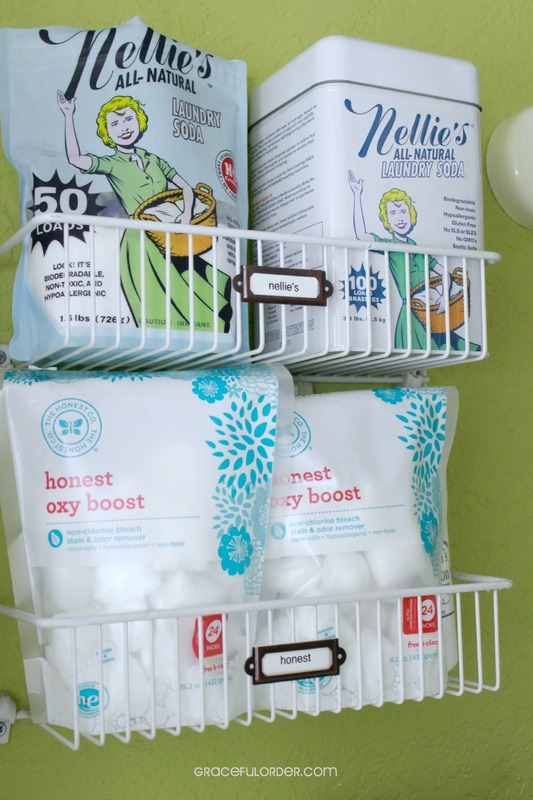 Saw your post on I Heart Organizing. 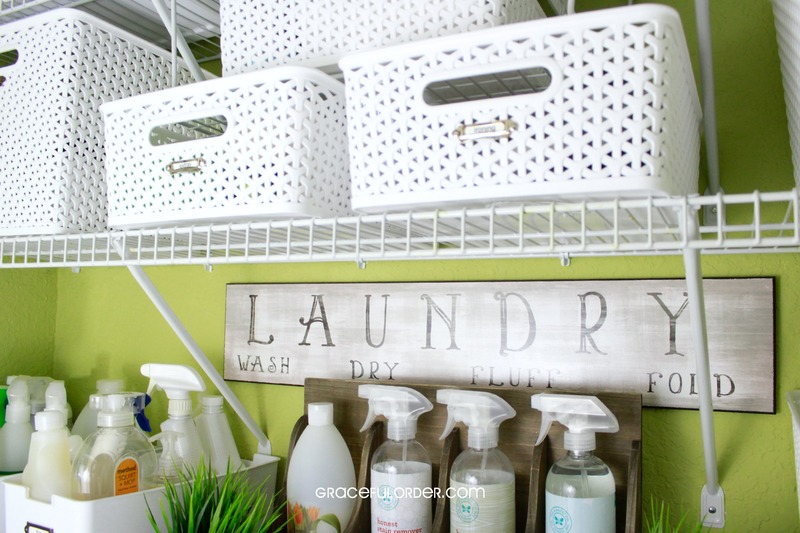 This laundry space is so springy and pretty! You did a wonderful job! I would love to hear where you got the drying rack hooks! They’re adorable! They are from the Young House Love line at Target but they discontinued them. I think that Home Depot is now carrying some of their hooks. Where did you get the “Laundry” sign and wooden “1,2,3,4” box? Thanks! 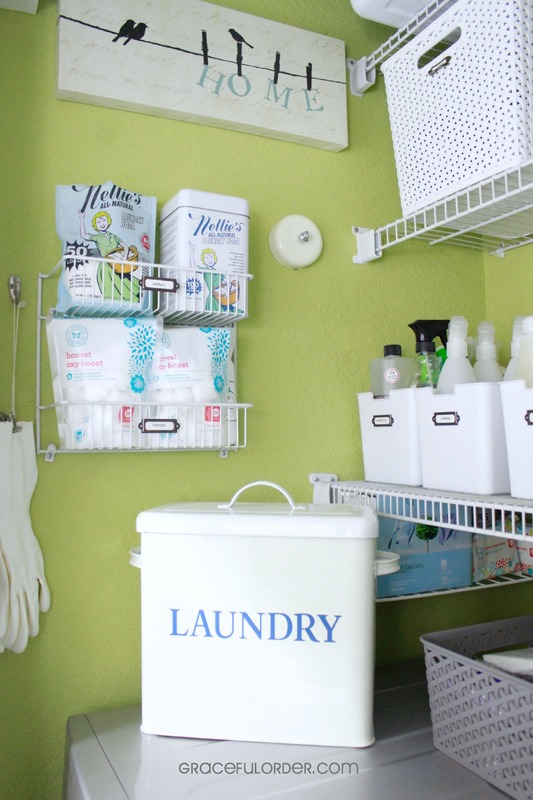 The laundry sign is from World Market and the wooden box may be found at Homegoods. Hope that helps! Can you please tell me where you got that green carpet runner? The green carpet runner is from Target. Love the wall color. Do you mind sharing which paint you used? Thank you! The wall color is Lemongrass from Sherwin Williams. Love this space! Fantastic – found you through iheartorganizing and I will now be following you! I just tried searching for that awesome garbage can on Target but couldn’t find it. Could you please let me know what the brand is? Thank you!! There is a sticker under the basket that says “Desk Wastebasket”. It doesn’t have a brand name on the sticker other than “Target”. I love what you’ve done with this small space! It’s amazing how much organization and decor go hand in hand. Also, I have to say, that color is fab! It’s a classic shade but it looks so Fresh and Modern the way you have it! Haha! 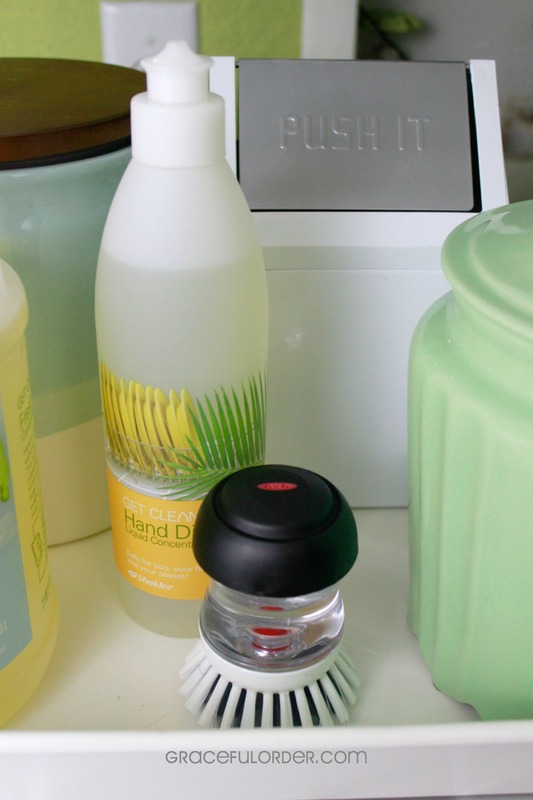 Maybe… All the white containers are from Target. Thank you for all your sweet words! I love the sign/painting with the birds and the word Home – where did you find it??? It’s so cute. I found it at Homegoods. Love that store! Love some of these ideas! I’m almost finished with my laundry room and will put some of these to use! 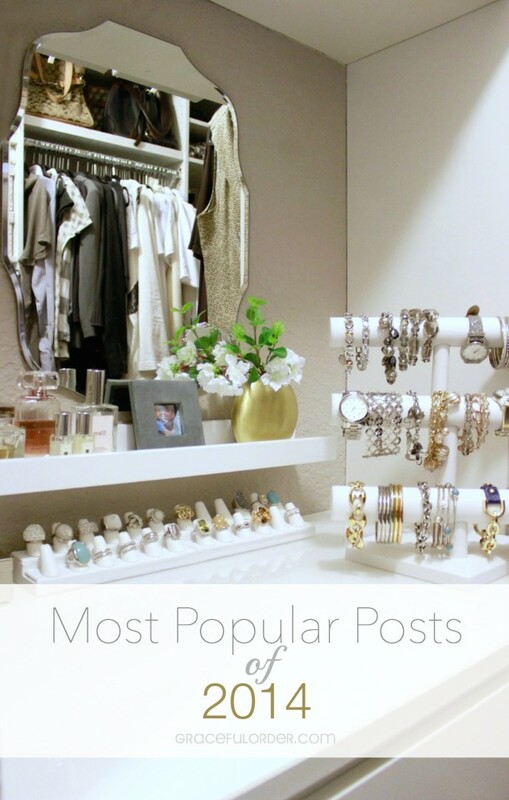 Awesome ideas and who couldn’t use an organized space? Great job! 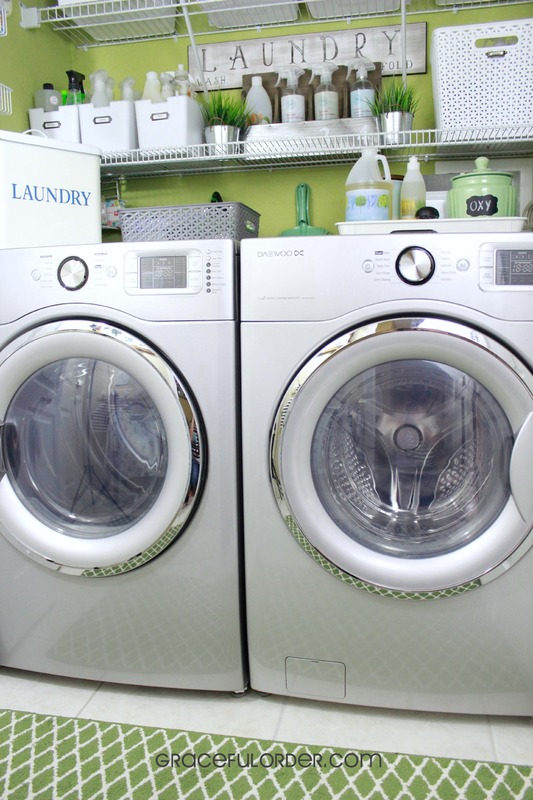 Love your laundry room! 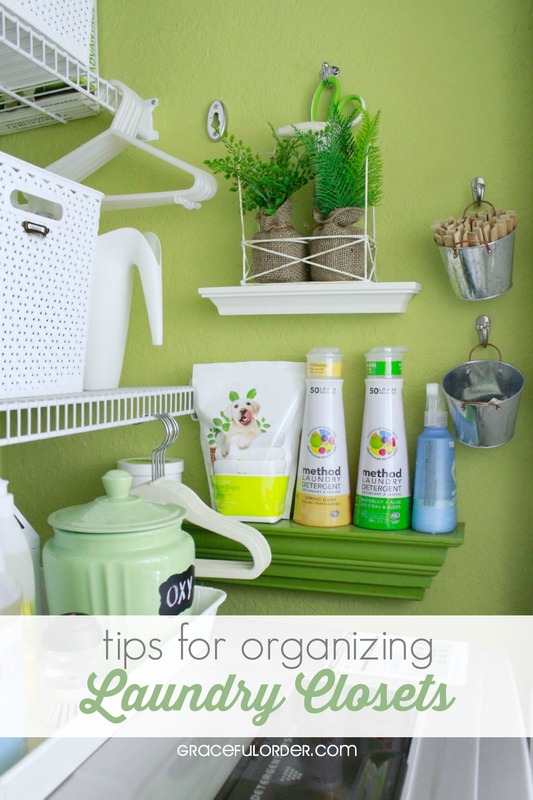 Perfectly organized, great tips! Wow, you have packed a LOT of style, color and function in to that space! 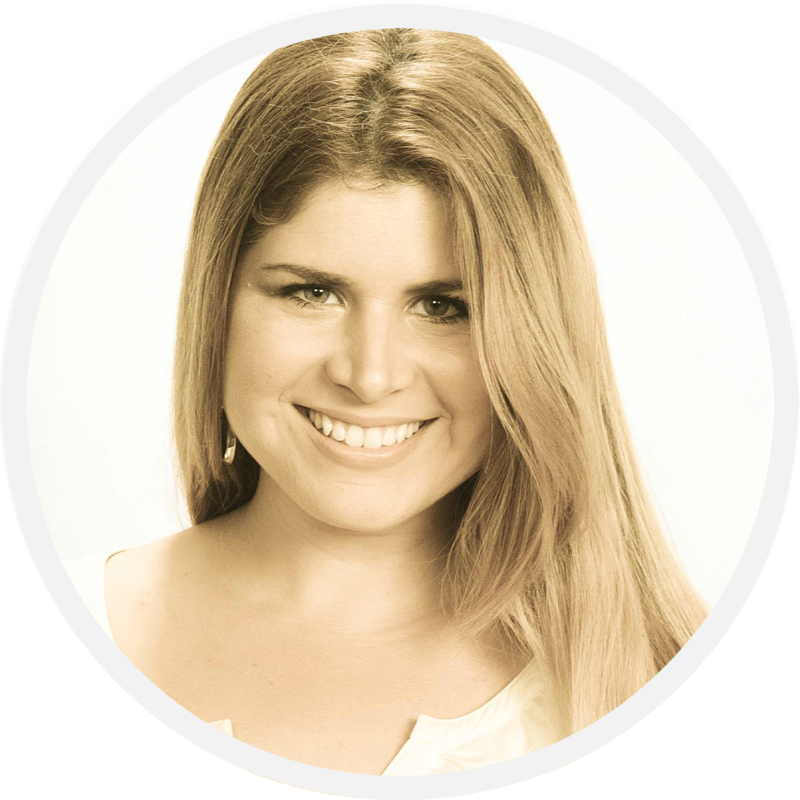 Thanks for sharing, I’m pinning so that I don’t forget to “borrow” some of your ideas! Thank you so much Kimm!! Love your ideas! Beautiful color too! I love green! Thank you, Debbie. Hi Wendy, the rack on the wall was a purchase from Homegoods (I think) but I purchased it many years ago. I have seen a similar one at Home Depot. I am a little late here, but love what you’ve done. My laundry closet is exactly the same size and colour! I wanted to know the depths of your back three wire racks… looks like the bottom is 12 inches and then above maybe 8 inches and even smaller at the very top? Thanks for the ideas!! I just measured them and the bottom one is 16 inches, which works for me because I sometimes rest a laundry basket in the very center of the shelf. The others are both 12 inches, although the top one seems to be a different brand so the lip is thinner (I think that’s why it appears smaller in the picture). Hope that helps and let me know if you have any more questions or you need me to measure anything else. Could you tell me where you purchased the 1,2,3,4 caddy for the honest cleaning bottles? Thanks! Hi Elisa, I found the caddy at Homegoods.